Drivers beware. The City of West Hollywood is stepping up enforcement of anti-gridlock measures as a reminder to drivers to “Don’t Block Traffic.” Beginning in February 2019, the City’s contracted Parking Enforcement personnel will begin monitoring major intersections during commute hours and will issue citations to drivers that block intersections or crosswalk areas. The aim is to help ease bottlenecks at intersections during rush-hour traffic and to increase pedestrian and bicyclist safety. Under the Anti-Gridlock Act of 1987, the California Vehicle Code (CVC 22526(a)) prohibits drivers from entering an intersection, even if the light is green, if there is not sufficient space on the other side of the intersection or marked crosswalk to allow the vehicle to completely pass through without causing interference with through traffic and pedestrian crossing. Drivers whose vehicles block crosswalks or are stopped in an intersection are subject to a citation of $118. While traffic laws and moving violations in West Hollywood are under the jurisdiction of the Los Angeles County Sheriff’s Department, anti-gridlock measures in the City are monitored and enforced by Parking Enforcement personnel, overseen by the City’s Parking Services Division. Renewed anti-gridlock enforcement is part of the City’s continuous commitment to explore a mix of measures to address safety. The constant movement of dense vehicular traffic and pedestrians in close proximity is an ongoing challenge not only in West Hollywood but in cities across the nation. During the past five years, the City of West Hollywood has implemented a variety of improvements as part of comprehensive plan with three unique areas to improve pedestrian safety: Engineering, Enforcement, and Education. As part of this, the City has added five new high-visibility striped crosswalks along Fountain Avenue, which feature small refuge islands in the center of the road to reduce the exposure of pedestrians crossing and increase motorist awareness of pedestrians crossing. The City has installed several new signalized pedestrian crosswalks along Santa Monica Boulevard and has installed solar-powered radar speed indicator signs along major corridors in order to remind drivers to drive within the speed limit. In addition, trailer-mounted Electronic Variable Message Signs have been placed at key locations within the City to encourage drivers to slow down and abide by posted speed limits. 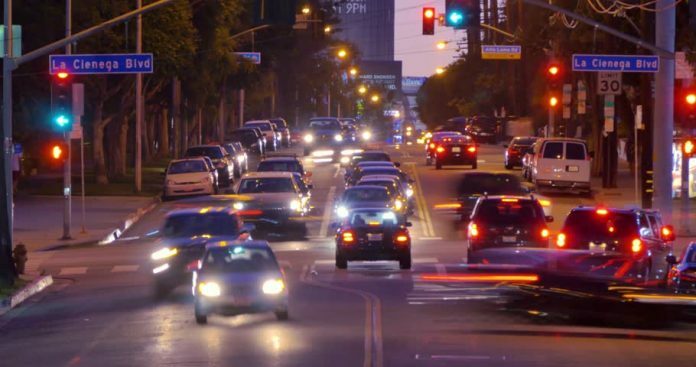 For more information about anti-gridlock enforcement, please contact Coby Wagman, the City of West Hollywood’s Parking Operations Supervisor, at (323) 848-6514 or at cwagman@weho.org. For additional information about the City’s engineering efforts to improve safety, please call the City of West Hollywood’s Department of Public Works at (323) 848-6375.